Google is the number one search engine, and to ensure that it continues to hold that position, it has availed several tools to help web SEO professionals. Novice users have Google Analytics at their disposal which offers in –depth information about a site’s performance in an easy to understand fashion. Full-fledged experts have the option of using the Google Webmaster Tools to fine-tune their websites to be more SEO friendly and also help Google index it. The Google Webmaster Tools is very essential for any strong SEO effort. Before we dive in on how to use it, let us first see what it has to offer. The greatest advantage of using this tool is that it will assist you in seeing your site as Google sees it. This is highly beneficial as it will give you an insight into your most popular key words, which pages have been indexed and much more. It is worth noting that a site that is active on Webmaster Tools is better placed at being fully indexed and ranked accordingly. There are three ways to set up this tool to monitor your site but the basic requirement is to have FTP access to your site’s host to enable you to verify the ownership of your domain. You can confirm ownership through Google Analytics if it is already set up on your site. The second option is uploading an HTML file that Google will provide, to your site’s root folder. The third option is placing a given Meta tag on your site’s homepage. After verification, Webmaster tools will start collecting information within 24-48 hours. Once you are set up, it is time to familiarize yourself with the interface. On the home page, you will get a list of websites that you have registered. Click on any site to see the detailed information pertaining to that site. On the left panel, you have a list of metrics concerning different aspects of your site. You can click on crawl to start crawling and any errors encountered will be displayed. The crawl statistics will also show any URLs that were not indexed probably because they are blocked. Search Queries give you information about traffic and keyword information. It is very useful when you want to see whether your efforts to get mapped for a specific keyword are working. It will display how many people are seeing your website for a specific keyword search (impressions) and how many are clicking through (click). After you launch a new SEO strategy, click on the “with change” button to see your change in performance over time. You can also drill into every keyword to see your average position and your performance. Simply click on that keyword while you are on the Search Queries section. This will help you align the content you are developing with the targeted selected terms and make necessary changes to existing content accordingly. Still on the search Queries, the top pages metric tells you which pages have the highest clicks and impressions. To test new features that are still in development, select the Tools Labs section. 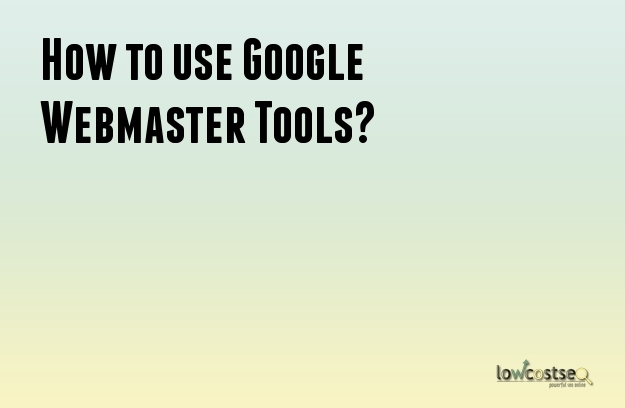 Google Webmaster Tools is huge but easy to master and very powerful if you know exactly what you want. This tool is a must have in your SEO arsenal.